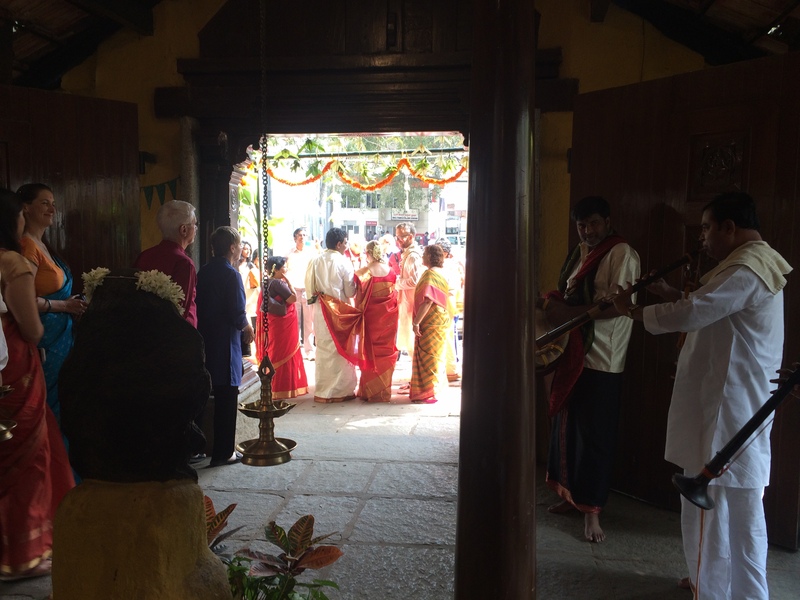 As you may recall, in December I traveled to India for our friends’ wedding. It was a whirlwind trip – we were there for only 5 days before shipping off to Hong Kong en route to NY. To be honest, I have been struggling with how best to encapsulate all that we experienced – I took over 500 photographs the day of the wedding alone. As a result, here is a pared down version of our adventure: Five lessons I learned from our trip to India – one lesson per day. 1. I love wearing a sari. This can not be said for all other forms of formalwear. 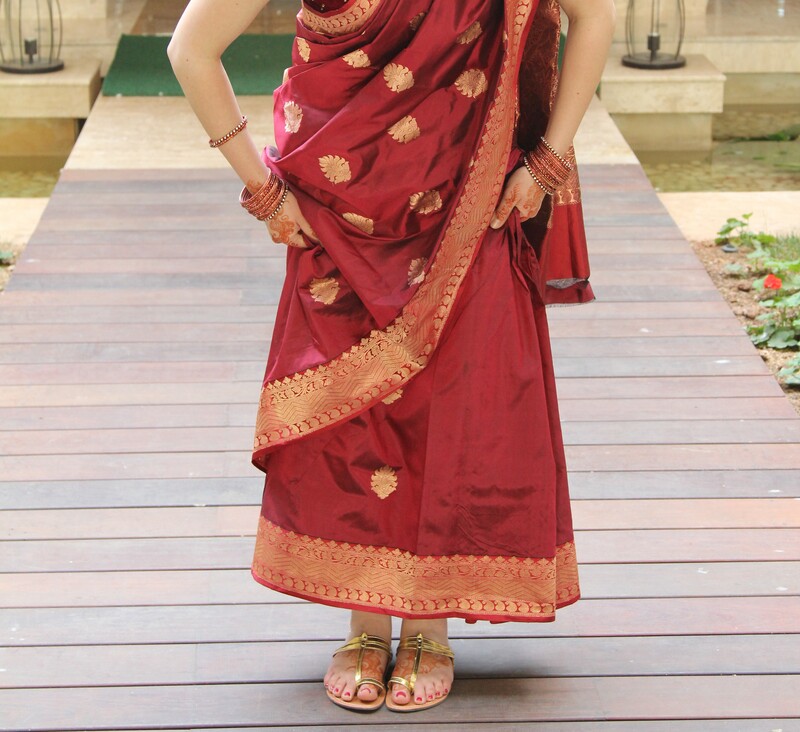 But, in a sari, I felt totally at ease and alive. I think part of the reason why I loved wearing my sari so much was that it was an adventure to assemble. The bride and groom very thoughtfully organized a shopping trip on Commercial Street in Bangalore the first day of our trip, to facilitate the process. Our first stop was Mysore Saree Udyog to pick out the cloth and blouse. I was overwhelmed by the sheer number of colors and patterns, but the woman helping me remained very polite, despite the fact that it was clear that she thought I was completely ridiculous and had no idea what I was doing (she was right). Then, to the intersecting alleyways to pick out sandals, bangles, and a petticoat. I was impressed by how rapidly the men at the bangle stall put together a collection of bangles that were perfectly matched to the color of my sari. I also noted a useful trick–slipping a plastic bag over your hand before the bangles, to help ease them on. We also stopped at Fabindia to ogle at the array of gorgeous dupattas and kurtas. It turns out that I love kurtas almost as much as saris – they very much resonate with my dress-over-pants-layering-for-SF-Bay-Area-came-of-age-in-the-90s aesthetic. I selected one that was lavender with a cobalt, magenta, and gold trim to bring home with me. The morning of the wedding, we were lucky enough to have professional sari drapers help us into our outfits (thank you again to the bride and groom). Word to the wise: If the blouse you try on in the shop feels too small, but you purchase it anyway because you are in love with it, there are stitches on the inside you can remove to let the blouse out in a few increments – even by picking at the thread feverishly with a safety pin the morning of the wedding. Safety pins also come in handy for threading the petticoat belt through the top of the skirt. And, of course, for pinning like crazy all the intricate folds in the outfit overall, so that everything stays in place and you can walk without worries. 2. 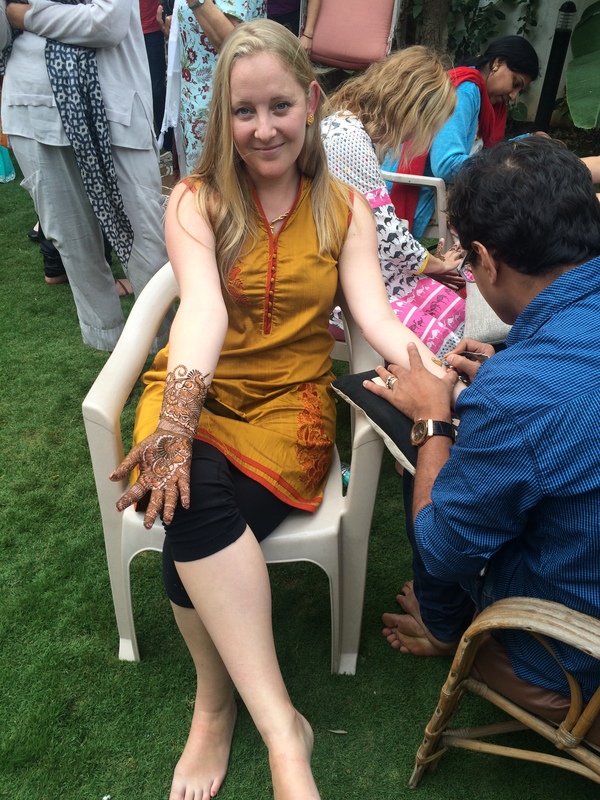 I think all women’s life cycle event gatherings should involve henna tattoo. 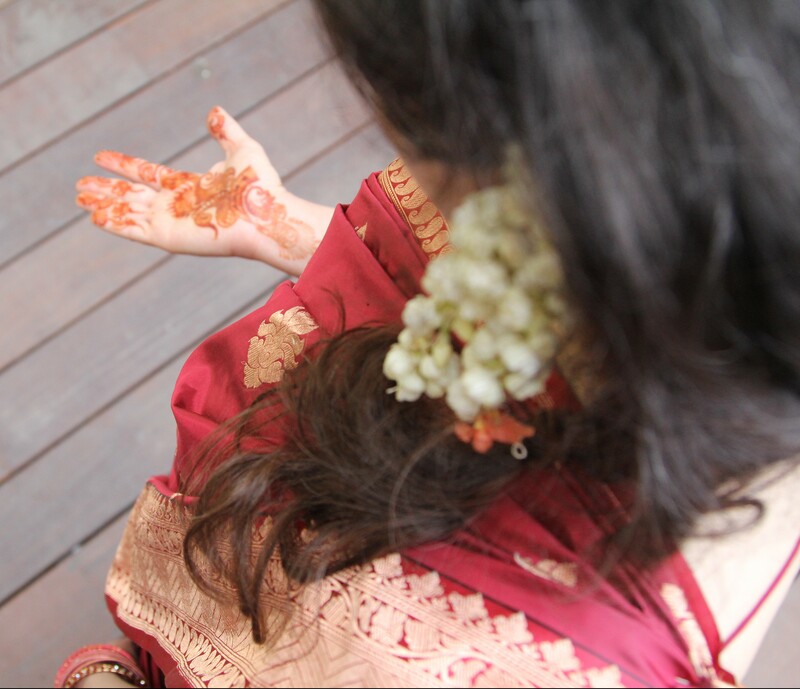 Is there really a better way to spend an afternoon with an intergenerational collection of awesome women than by sipping champagne and eating fresh pakora in a garden while chatting and getting beautiful, intricate, designs that will last several days painted on your hands and feet? The bride’s tattoos were particularly intricate and took several hours to complete. My favorite part? In accordance with tradition, the artist inscribed the name of the bride’s beloved into the design, for him to find later. So romantic. 3. Hindu weddings get a lot of things right. Specifically, I love how the ceremony is conducted. As with many weddings, this wedding had a performative element. But what set it apart, was that the performance seemed to be less for the benefit of the audience than for the participants – as, I believe, it should be. This freed up the audience to talk, roam around, and get something to drink, while the bride and groom and their families negotiated the finer points of the ritual. It also lifted some of the pressure off the couple by removing them from the spotlight, so that they could focus more on what they were doing. It doesn’t hurt that the ceremony also involved live music, a fire pit, getting fresh flowers pinned in your hair, and being anointed with rose water. 4. 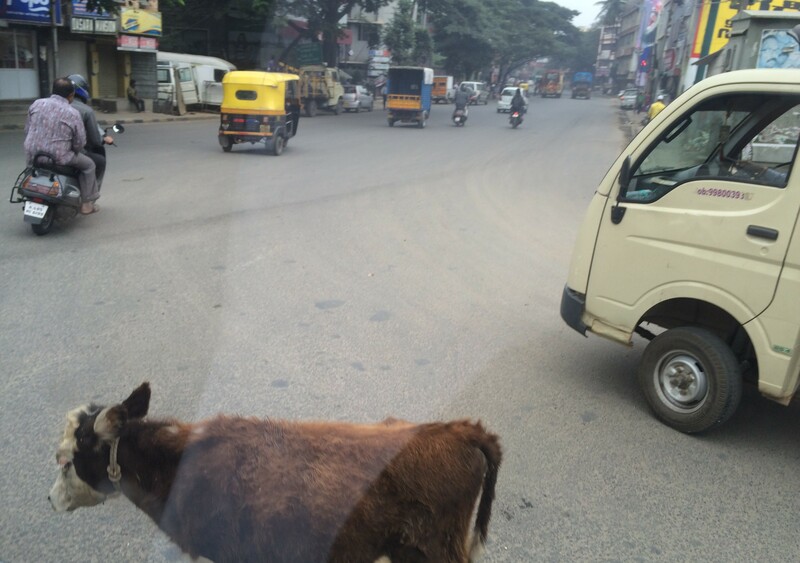 When you cross the street in Bangalore, you take your life into your hands. There are signs reminding motorists to obey traffic laws. And the streets are packed – with electric rickshaws and trucks; with street vendors peddling to stalled vehicles; with motorcycles, often transporting small children strapped in only by their parents’ arms. And, yes, with cows. 5. 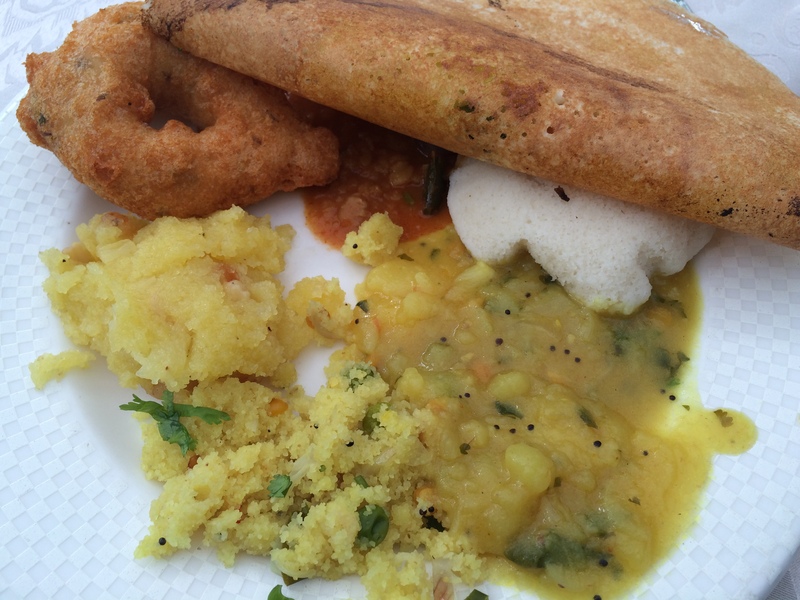 Fresh dosa, vada, sambar, and idli-not Wheaties–is the breakfast of champions. You have whet my appetite, India! I will have to return – for a longer stay – another time. So so happy you loved it! Thanks for your tips pre-departure! !